Debbie Hodge has a healthy dose of that crucial trait all successful entrepreneurs seem to have — adaptability. When she saw that the magazine business was tanking, she realized she needed to find a new venue for her information, so she moved her teaching online. And when she saw everyone in her space was teaching her topic using how-to tutorials, she decided to take a different approach and focus on storytelling and design. It has been so good that she’s now made the ultimate “meta” move: she’s teaching others to do what she herself has learned in recent years. Debbie’s story is this month’s Hero’s Journey feature. We’re tapping the collective wisdom of our community members to bring you reports from the front lines of the content marketing world. See all the Hero’s Journey posts here. Read on as Debbie shares her story. Debbie Hodge: I’ve owned Get It Scrapped — an online business that offers scrapbooking education — since 2007. The primary product offered is an educational membership with classes focused on scrapbook layout design and storytelling. I take a different approach from the rest of my industry, which usually offers how-to, project-based education. Teach What You Do, which began in 2015, is where I offer a single flagship, premium-priced online class: the eCourse Blueprint, an 8-module, 24-lesson, A-to-Z blueprint for creating and selling an online course. Everything is online, including lessons with video, audio, transcripts, slides, and workbooks. Live “office hours” and “guest expert” webinar sessions supplement that “on-demand” lesson content. I’ve been creating and selling profitable online courses for nine years. I understand the process, the technology, and I’m always thinking about creative ways to teach in an online classroom. Debbie Hodge: The unique angle I’ve taken in the scrapbooking training niche is to focus on scrapbook layout design and storytelling, as opposed to the common models of teaching technique via specific projects and products. That has helped my materials stand out. I also strategically use lead magnets, list segmentation, and email marketing to sell Get It Scrapped memberships. It all started after I wrote a book for the scrapbooking industry and worked as a contributing writer, designer, and editor for two scrapbooking magazines. Magazines were going out of business and I realized I’d never been able to cover the kind of ground I wanted to in articles, which were kept short and simple. Teaching online was a solution — and a way to make money. My early classes were taught in protected forums and online bulletin boards. Debbie Hodge: In October 2015, I was ready to launch the Teach What You Do eCourse Blueprint — but I only had 17 prospects on my email list for the new business. This was a huge contrast to my business at Get It Scrapped, where I had a list of more than 19,000 people and I was using three solid lead magnets to grow my list daily. I felt anxious to get my product launched and delivered within 3 to 6 months because I knew there were already a few people offering course-building courses — and I could anticipate there would be many more coming. I’d been working on the content for almost a year, and I feared if I didn’t launch soon, I never would. One more reason to get the course launched was to have a premium-priced product to complement the lower-priced membership at Get It Scrapped. I knew that with an engaged list of the right prospects, I would likely convert three percent of my prospects to customers. With that in mind, I began using Facebook ads to promote appropriate lead magnets to build a list of 2,000 people by January, when I planned to offer the class for sale. Throughout October, November, and December, I used ads to promote six teaching webinars, a free video series, and a free Facebook group. In late December, I offered early-bird pricing to the most engaged people on my list and sold 30 seats in the class. With this initial success, I bought even more Facebook ads to promote early January webinars during which I taught and sold the class. By the second week in January, I had 65 students, revenues of $24,000, and Facebook ad expenses of $4,000. My class was launched. The successful launch gave me a new confidence in list-building processes and a thrill to be able to prove to myself — and my new students at Teach What You Do — that you can launch a business in three months and grow an engaged list of prospects when you use the right lead magnet content. For me, the right lead magnet content gets people taking first steps toward creating an online class using processes and tools that I teach them about in live webinars. Live teaching webinars are currently great list and engagement builders for Teach What You Do. These sessions get people started on their own online classes, and they let prospects get a solid sense of my teaching style and knowledge since we’re online together, live, for an hour. 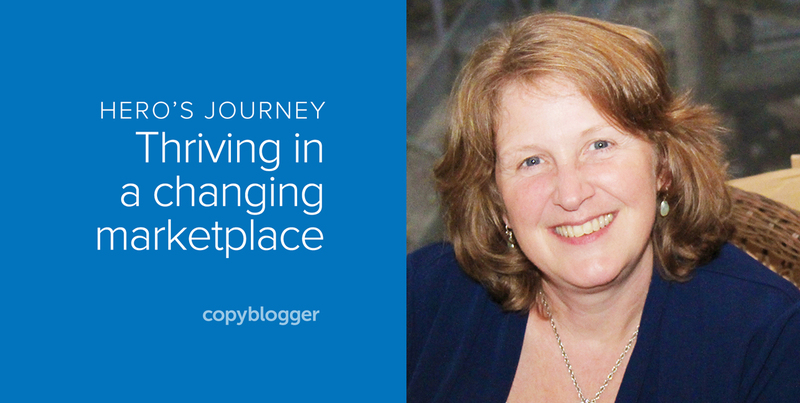 Debbie Hodge: I’m a member of Copyblogger’s Authority and Digital Commerce Institute. I enjoy the community and continued learning. I’ll attend the upcoming live event, Digital Commerce Summit, in Denver this fall. Also, I’m a Copyblogger Certified Content Marketer and keep that certification current with my Authority membership. Connected to this goal of improved email communications is increased conversions. Both businesses need better sales funnels, and improving emails is the first step toward achieving that. Thanks to Debbie for appearing in our Hero’s Journey series. Next article: Cracking the Abundance Code: Sonia’s in a New Documentary! This article helped me validate a couple of things I’m working on. One is a product that happens to have a very small list and I’m apprehensive to start promoting it. Also, I’ve been looking at teaching what I do; I love that’s how you put it, too. I had a “ding, ding, ding” moment there. Thanks! If I were to sum up my take away it would be this: You don’t have to be perfect, you just have to start. I loved that aspect of Debbie’s story too, Alex. You can’t really learn unless you put something out there and see what happens to your idea once it’s out in the wild. Alex, I’ve found that an advantage to taking action before perfection is that you have flexibility to get to a final product that’s shaped by the reactions to your early versions. Debbie, you are an inspiration! I’m always amazed by the amount of content you share in your classes. Thanks for sharing some figures on your Facebook Ads, I always wonder if they are really all that effective. I will be watching your businesses grow with interest! Thanks, Melissa, The ads were very effective for me. I’m looking foward to seeing your upcoming launch. Your story is inspiring Debbie! Thank you so much for sharing Pamela. I love how you use your own journey to inspire your students that building a course in 3 months is possible. Great recap of Debbie’s recent journey! So good to see the numbers and the thinking process about starting from scratch and launching new business. I’m one of those that got happily snagged by Debbie’s content-rich webinars. The Teach What You Do course organization and clarity are top-notch, so I’m eagerly following her guidance as I prepare to launch myself soon, too.